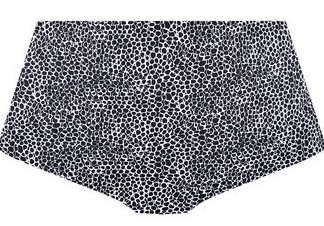 Discover Run Wild from Freya, a free-spirited, monochrome animal print swimwear collection complete with a fun frill detail. The tankini top features an integral bra shape with a powernet back wing for great shape, support and anchorage in cup sizes D - G.
The Freya Run Wild Uw Moulded Bikini Top in Black is based on the Freya Idol shape and is the perfect classic island life style design which is the perfect partner to the windswept beach hair. Run wild is a free spirited monochrome animal print story. Some of the styles shapes have been designed with a fun waterfall frill detail giving this look a full on island life feel. With the seamless and lightly padded cups for support and shape. Time for holidays spent on a tropical island - with the Wild Run collection of course! An animal camouflage and valance is a remarkable combination. You will certainly find yourself in this style. UW Padded Frill Bandeau bra is a proposal with slightly stiffened cups and whalebone. Straps are removable, so you can enjoy a regular tan. The flounce gives volume and emphasizes feminine qualities.